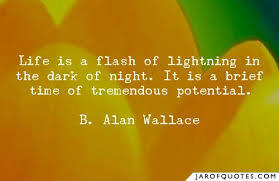 A flash of lightning is the measure of our life here on this earth, and consequently, for that reason, we should become a skillful master of how to live it. Day by day our experiences mould the vital life force that speaks to our Soul. Our immortal Self must be allowed to thrive on what provides sustenance to feed its hungry appetite for adventure. As humans, we wildly dream of what we wish we had, what we think we need if only there was and when I become….will there ever be the perfect time to put your dreaming into action? This life experience has one goal, and this goal was a promise we made to our Self before we came, to discover who we are. The meaning of our life is to know who we are before we die. We are meant to have relationships along with our journey, but the most meaningful relationship is supposed to be with our Self. Our obligations are many, our responsibilities overwhelm at the best of times, duty, honour, and loyalty often unconsciously hold us hostage from what is essential for our Self. Our suffering is meant to be the journey to realizing who we are, therefore what and how we suffer must not go in vain. To grant our Self the honour of a connection to our Soul does not come without a dedicated commitment. The allegiance we make with our Spirit must be with loyal fidelity. The path to Self realization has many twists and curves, and yet our attentiveness to detail will never go unnoticed. As we begin to shift the suffering from our insides to the external, our pressures and burdens seemingly melt away, like ice on a scorching payment on a hot summer day. A flash of lightning is what we often say to measure the length of our life thus far, how quickly the years have passed. How many years do you have left and how do you want to live from now on? These are the questions you must ask yourself today because life is for living breath by breath, day by day. Living may not include trips around the world or climbing the highest mountains, living may simply be just a chance just to ‘be’ and a reunion with your Self.